In my memories I’ve always had a bike at home, probably my most favourite toy for many years. Then at the age of 14 I discovered my first road bike (a very cheap one). It gave me great pleasure to explore the places around my hometown and further away. Whilst enjoying this freedom I also learnt how to take care of my precious vehicle, learning the basic mechanical tricks. When I was 18 years old I got my first mountain bike and a new frontier was opened to me. 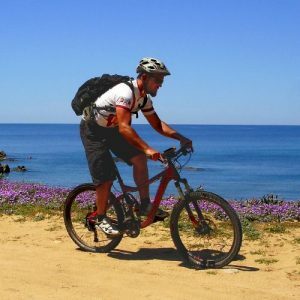 I’m lucky to live in Sardinia, a beautiful island in the Mediterranean Sea, a huge natural park, perfect for mountain biking and every outdoor activity. Since that moment I completely forgot the road bike and dedicated myself to mountain biking. I did some competitions, cross country and some downhill races as well, but most of my pleasure was and still is just riding in the wilderness, in peace with myself, and having fun with friends. In 1999 I started organising excursions for friends and little groups, when by coincidence I met a new tour operator searching for guides in Sardinia and I started with enthusiasm to be a guid. At that time I was an accountant, busy and stressed, so for me doing 2 or 3 tours a year was the perfect stress relief. A way to reconnect myself with my soul. After a few years the business was growing a lot and for me it was the unique opportunity to change my life in a very positive way. Now after 15 years being a full time guide, I’ve done something like 150 tours, not only in Sardinia but all over Italy and in some other countries. Not all mountain biking but also on a road bike again which has been a great re-discover. I’ve seen many beautiful places, but probably my favourite is still my beautiful island. On a mountain bike or on a road bike, the variety of environments, the stunning views, the climate and the great food! Sardinia for me is one of the best destinations for a cycling holiday. I have to give a special mention to the magic Dolomites, a bit demanding sometimes but incredibly beautiful, a must see! Apart for my unconditional love for the bikes, what I love most about my job is meeting people and sharing my passion with them. In my years guiding I’ve met so many people who have often become my friend and all of them enriched my life in many ways. … And I’m still searching for new friends.